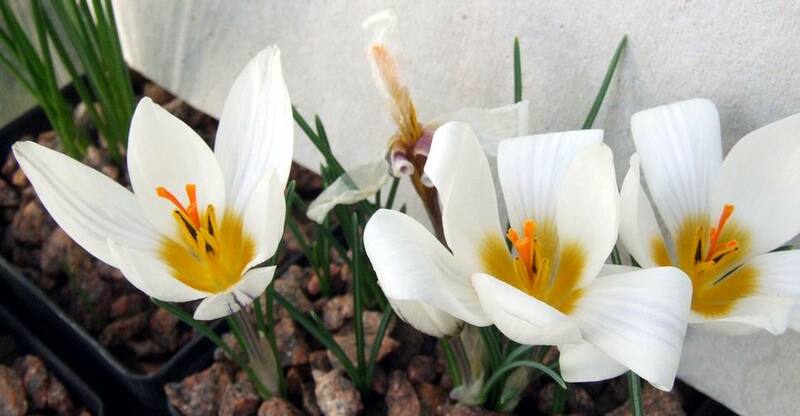 The bad treatment of bulbs is never to be recommended but when it is done accidentally or absentmindedly, it often provides us with interesting observations. 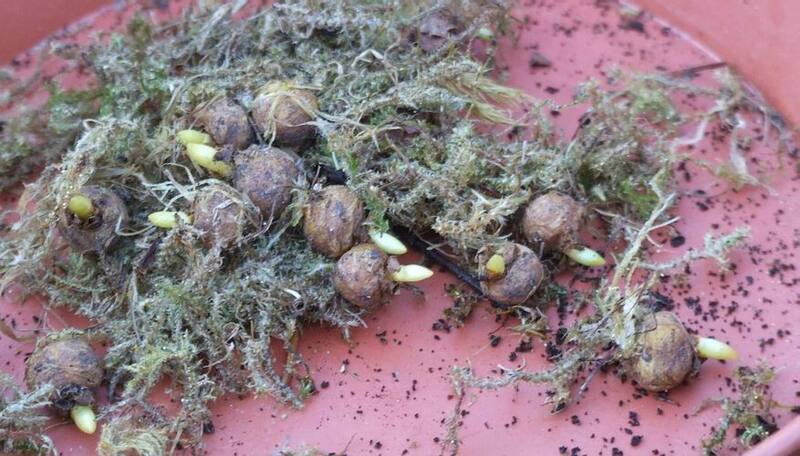 These Corydalis malkensis bulbs have been stored in just moist moss (raked out of my neighbour's lawn) in a plastic zip lock bag and have been lying in a corner of my bulb shed since July. 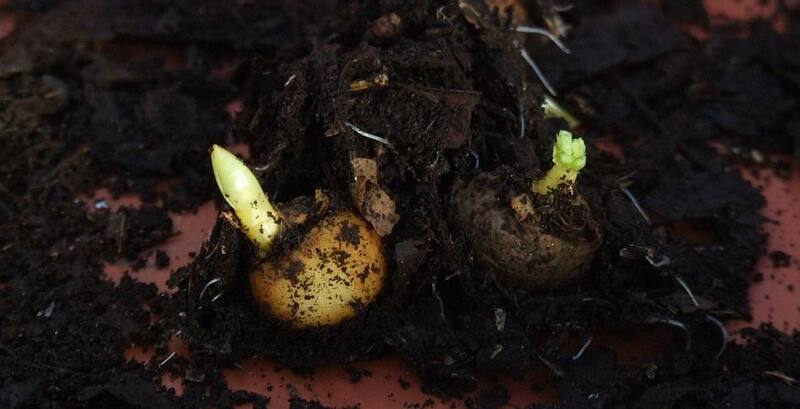 As you can see they have come to no harm at all and it is fascinating to see that as their shoots slowly extend they have very little in the way of roots yet; closer inspection reveals the roots are just starting to grow. A few corms of Corydalis 'Beth Evans' also spent the last few months in a similar situation except they were stored in leafmould. 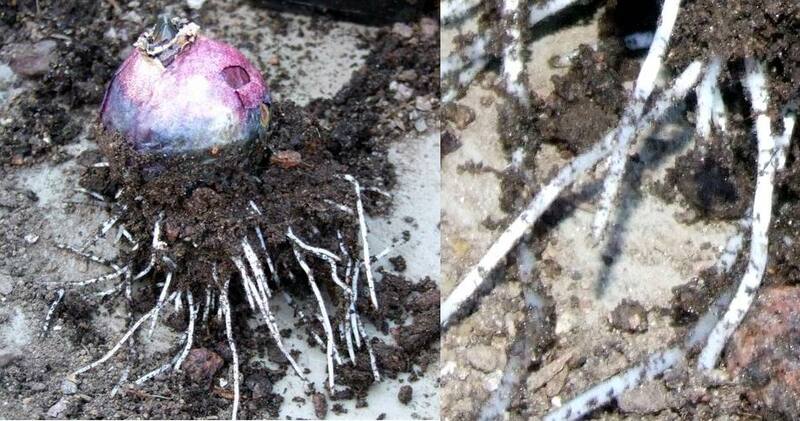 Note how they are also extending their shoots, you can even see the embryo flowers in the one on the right, and they have quite a lot of root growth. The question I am now asking myself is, are these roots appearing on Corydalis 'Beth Evans' because it has a slightly different growth pattern to C. malkensis or is the different degree of root activity a result of being stored in leaf mould as opposed to moss? I am going to have to do a controlled experiment next year to satisfy my curiosity; if I can remember. 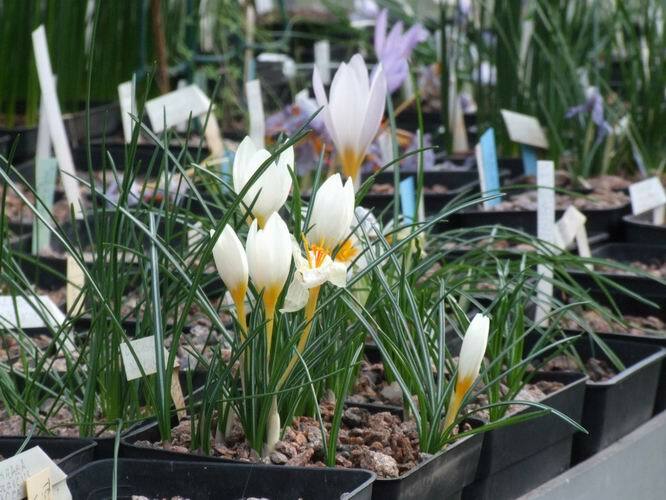 A late pot of Crocus hadriaticus is still in flower over a month after the first pot flowered, all helping to extend the early Crocus season. 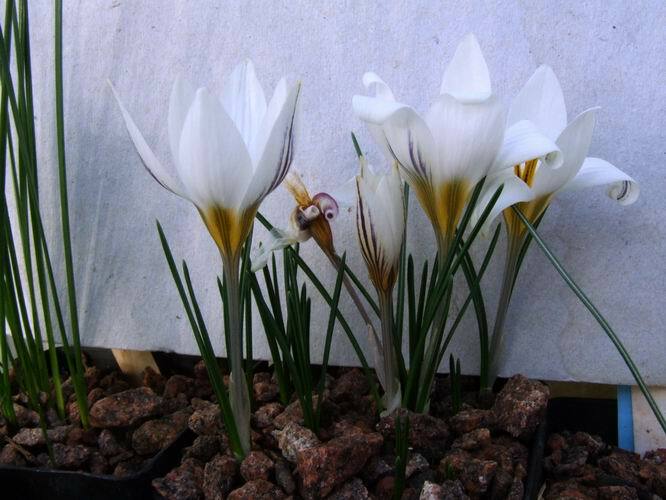 Also in full flower is Crocus biflorus ssp melantherus, no I have not made a mistake, this is an autumn flowering subspecies of the very variable spring flowering Crocus biflorus. Looking inside the flowers you can see one of the other diagnostic features of this sub species and that is the black anthers. They are black before they dehisce (open) and you can still see the black anther casing surrounded by the golden yellow pollen grains. 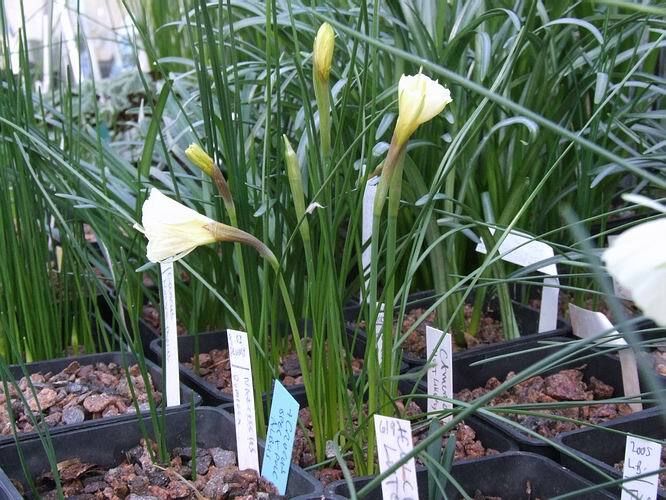 One pot of Narcissus cantabricus var foliosus should be much like another but life with bulbs is never that simple. 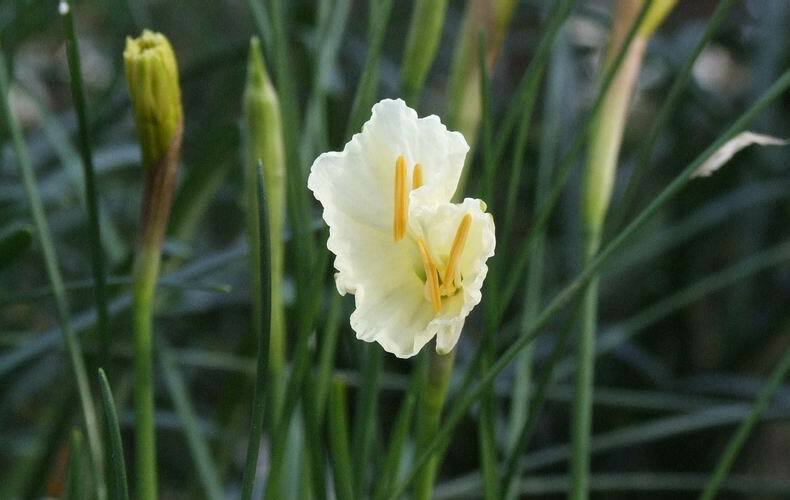 If you think that the taxonomy of the hoop petticoat narcissus in the field is difficult to follow then you should try sorting it out in cultivation where we get all sorts of mis-names and hybrids occurring. Here is a pot worked up from a few bulbs that I received as Narcissus cantabricus var monophyllus which does look superficially similar. istinct pedicel so I think should conform to var foliosus so I have to put a big question mark on the pot of var monophyllus. The flower on the right has almost no pedicel and is also labelled N. cantabricus var monophyllus and it has a very sweet scent can this be the correct plant? Ah well, what ever they may be called, I love them all and it keeps me busy going back and forward between the books and the flowers trying to work out what they should be called - perhaps they have all hybridised in cultivation. When I take a close look at one of the above flowers it has green tips to the petals and displays some of the features described for the variety kesticus!! At least the taxonomists do recognise that the differences between these flowers are not sufficiently distinguishable to give them sub specific status - they are just varieties. 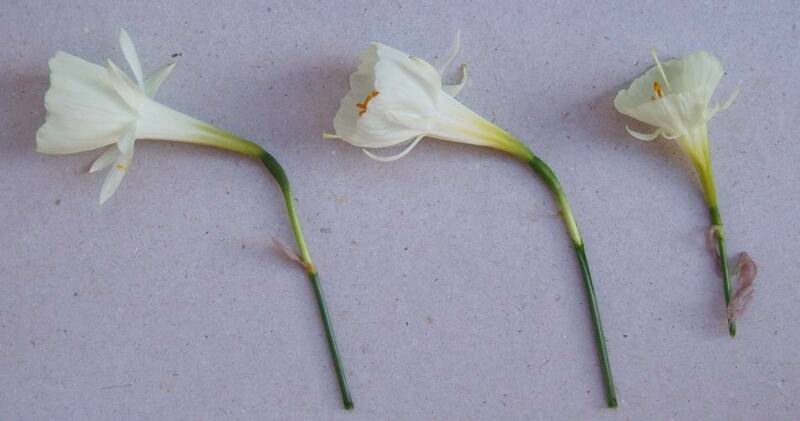 Enough about the complexities of putting precise names to the Narcissus let's just look at a few for their beauty. Two here easily distinguished by the protruding style and anthers of the right hand specimen. 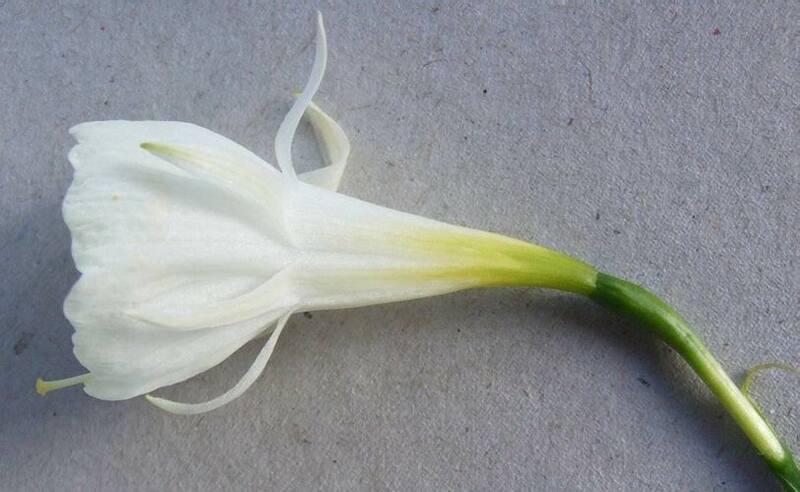 Even the way they unfold as they emerge from their buds, like a silk parachute which has been carefully folded to ensure that it deploys correctly, the wrinkles gradually unfurl and in a few days the flower will be perfectly open. 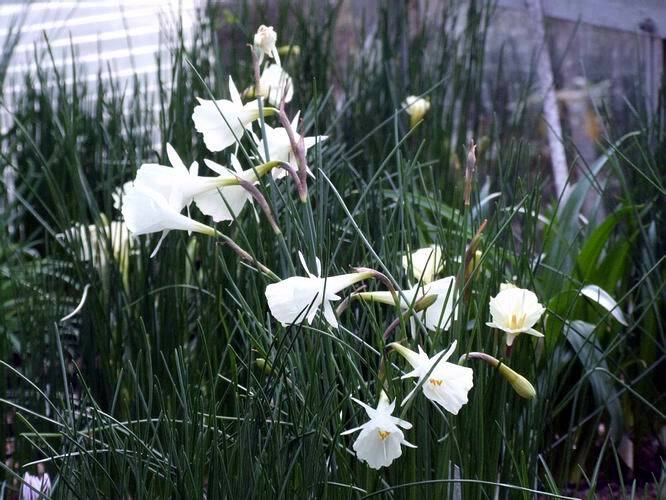 These I know are hybrids among Narcissus cantabricus and romieuxii as they are seedlings raised from the fertile cross Narcissus 'Camoro' a cross between CAntabricus var MOnophyllus and ROmieuxii.